UPDATE: The round-up for Dessert Wars: Nuts for Nutella has been posted. Please check out everyone else's delectable creations. I didn't end up winning but did get runner-up =). When Flickr user Momma Cupcake contacted me recently about her new Dessert Wars contest, I wasn't sure I could fit more baking into this week's busy schedule. That was before I saw the theme (Nutella!) and prizes (details below) though! Needless to say, I crossed the distance from on-the-fence to eagerly-on-board faster than you can say "Nutella-holic." 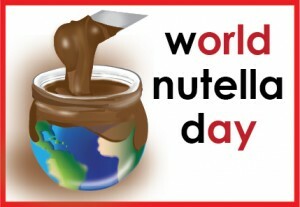 Also with World Nutella Day just a week away, I couldn't help but join in on the fun! For anyone who's unfortunate enough to have never tried Nutella =p, it's an amazingly rich and creamy chocolate hazelnut spread that's fantastic on everything from crepes to cakes to my fingers. 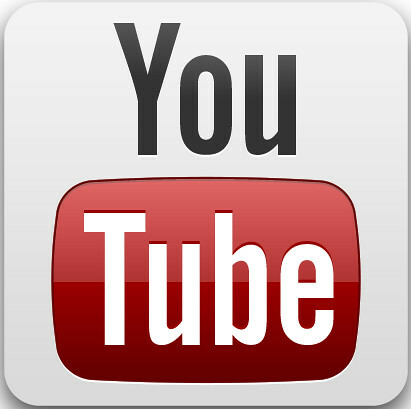 If you're still hungry to learn more, click right here. Readers who're familiar with the alfajores from South America may have already dubbed these cookies a misnomer. And you would be right. These chocolate cookies hardly resemble the tender white biscuits enclosing decadent dulce de leche caramel that we know and love as alfajores. Still this recipe was in fact adapted from one for true alfajores, and thus the title pays homage to that history :). As much as I adore traditional alfajores, I find this version to be a true treat in its own right. Both crisp and tender, the lightly chocolatey cookies complement the generous smear of Nutella inside. Rolling them through fragrant, lightly roasted crushed hazelnuts makes for enhanced flavor and presentation. If you're looking for a sweet indulgence for World Nutella Day, Valentine's Day, or any other day of the year, I hope your search ends here ;). Thank you to all our prize sponsors! I'm also submitting this to World Nutella Day, hosted by Sara of Ms Adventures in Italy and Michelle of Bleeding Espresso, which will be on February 5. Sift together flour, cornstarch, cocoa powder, salt, and baking powder. Set aside. Using a handheld electric or stand mixer, beat butter and sugar together until light and fluffy. Add whole egg and yolk and beat until incorporated. Add vanilla and brandy and mix well. Finally add the flour mixture and mix by hand using a wooden spoon or spatula until you get a soft dough. Refrigerate for at least 2 hours, preferably overnight. Preheat the oven to 275 degrees F. Divide dough into 3 equal parts, and work on one at a time while keeping the rest covered. On a floured work surface, roll out dough to desired thickness, between 1/16 and 1/8-inch. Cut into rounds (traditional shape) or whatever shape you choose. Save scraps to re-roll (only once) and use at the end. Transfer to a baking sheet lined with parchment paper or a silicon mat. Bake for 12 to 16 minutes, depending on size of cutter. Cookies should be just cooked but not browned. Repeat rolling, cutting, and baking cookies until all the dough is used up. Let all cookies cool completely. Transfer chopped hazelnuts into a medium bowl; set aside. 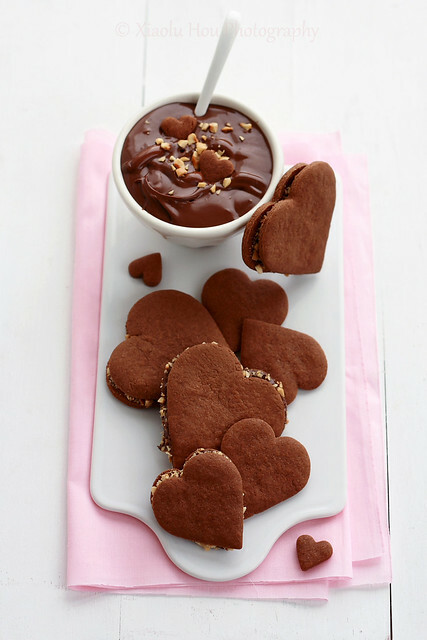 Once cookies have cooled, spread a spoonful of Nutella on one cookie and top it with another of similar shape and size. Press together gently, then roll edges of cookie sandwich in chopped hazelnuts. Repeat with remaining cookies. Posted by Xiaolu at 5:00 PM 78 comments so far. Add your own? I try to limit most packaged, processed food to minimize our intake of sodium and preservatives and also to save money/packaging. But one thing P and I just can't give up are Wheat Thins crackers. They're perfect to snack on when I get the munchies (which is pretty often). While I enjoy their subtly sweet and salty flavor straight from the box, P loves them best with slices of cheese or a dollop of creamy peanut butter. 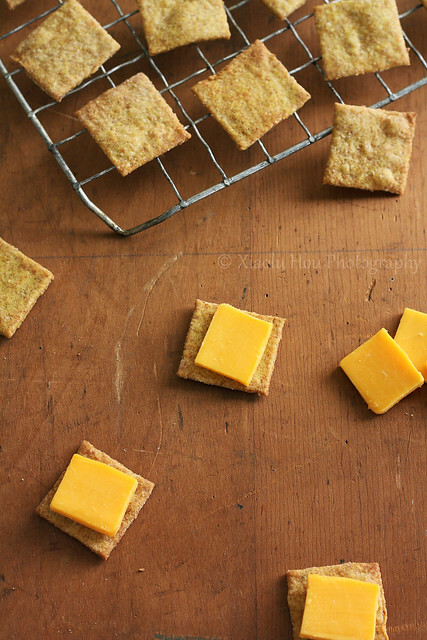 Making my own "wheat thins" turned out to be even easier than I expected. The dough was a cinch to mix up. Thus the hardest part was just rolling and cutting out the crackers (which wasn't very hard at all). Best of all, it seemed to me that KAF really nailed the flavor. My only warning to you is that these disappear fast (I ate half the batch before P even got home). Better just make a double or triple batch to begin with =D. My question for you, dear reader, is whether you've made any favorite boxed snacks at home? Tell me all about it in the comments! XIAOLU'S NOTES: I recommend doubling or tripling this recipe because 7 dozen is fewer than it sounds, especially when shared among several people 8). 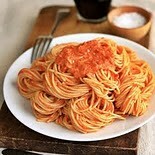 Since my boyfriend P likes his food very flavorful, I'm going to try making the Ranch variation of this at home, too. In the meantime, I've added a little garlic and onion powder to up the flavor to his liking :). Combine the flours, sugar, salt, paprika, turmeric, garlic powder, and onion powder, if using, in a medium bowl. Stir to combine. Cut the butter into small pieces and mix it into the dry ingredients thoroughly, using your fingers, a pastry blender, a mixer, or a food processor. A 3 tablespoons of water to the flour mixture, mixing just until smooth. If dough is too dry, add remaining water a teaspoon at a time until all the flour is incorporated. Cover and chill dough for 5 to 10 minutes. Preheat the oven to 400 degrees F. Lightly grease baking sheets or line with parchment paper. Divide the dough into 4 pieces; keep the other pieces covered with a towel while you work with one at a time. Lightly flour your work surface and your rolling pin and roll the piece of dough into a large rectangle, which should be at least 12" square when trimmed. Keep your rolling pin and the outside of your dough evenly floured. Flip the dough frequently to keep it from sticking, but too much flour will make it difficult to roll. Keep rolling until the dough is as thin as you can get it without tearing (about 1/16-inch thick). Trim the dough to even the edges and use a pizza cutter or a sharp knife to cut the piece into squares approximately 1 1/2" wide. Transfer the squares to a prepared baking sheet; you can crowd them together, as they don’t expand while baking. Sprinkle the squares lightly with salt. Repeat with the remaining pieces of dough. Save the scraps under plastic wrap and re-roll them all at once just one time. 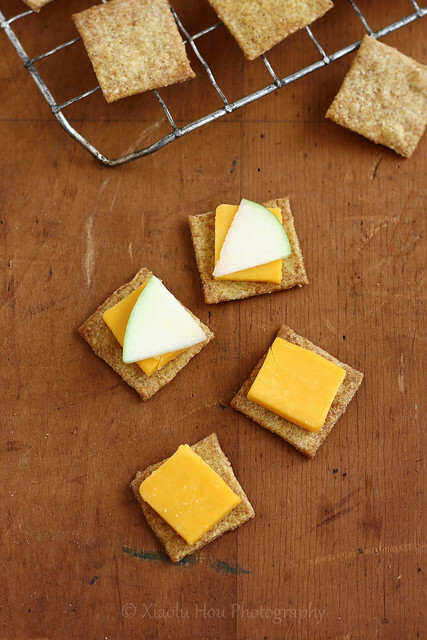 Bake the crackers, one sheet at a time, until crisp and browned. Check crackers after 5 minutes. If some of the thinner crackers brown too quickly, remove them. Then usse a spatula to stir remaining crackers around and return them to the oven to finish baking for another 3 to 5 minutes. These crackers bake quickly, so watch them closely - even 30 seconds can turn them from perfectly golden to way too dark! Remove the crackers from the oven and cool on the pan, a wire rack, or a plate; they cool quickly. These crackers will stay crisp for several days, but are best stored in airtight containers. Posted by Xiaolu at 11:30 PM 68 comments so far. Add your own? Posted by Xiaolu at 6:00 AM 18 comments so far. Add your own? Now let's chat about these cupcakes. 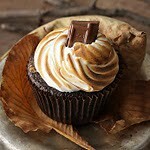 I tell ya, I never expected popcorn to show up at all on this blog, much less in a cupcake. Taking inspiration from unexpected sources is not uncommon here (remember the apple and brie, mojito, or Ferrero Rocher cupcakes? ), but I just happen to hate popcorn. I mean, toss me on a deserted island with nothing but and I will munch. Or...simply have the new cupcake contest I've joined name popcorn as its latest challenge. Suddenly, popcorn was on my mind -- morning, noon, and night! 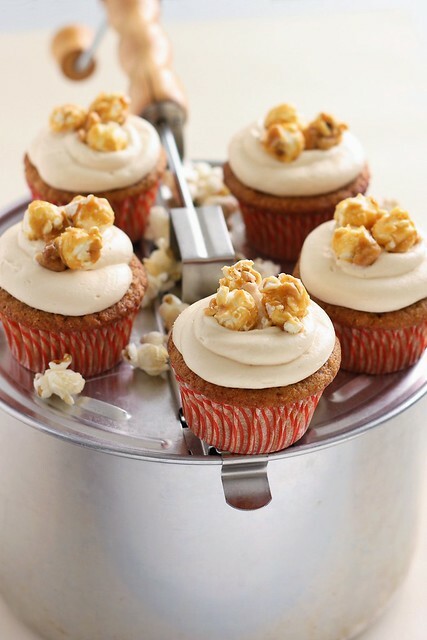 Eventually I assembled a recipe for caramel popcorn cupcakes and checked it twice. Then I baked it up and tasted it thrice (yes, 3 times ^_^). And it was...both a success and a failure. Despite infusing the liquid for my caramel with fresh popcorn, its flavor didn't come through in the frosting (which is why I've omitted that step below). Popcorn enthusiast that I am not, this "failure" wasn't that disappointing. Especially when I managed to "salvage" 20 tasty cakes that were sweet and moist due to creamed corn puree, with a nice crunch from the cornmeal, and swirled with silky smooth caramel buttercream. To top things off, even I couldn't resist tossing on some caramel popcorn. Bon appetit! XIAOLU'S NOTES: I simply pureed canned creamed corn using a handheld immersion blender; you could also use a standard blender or food processor. Homemade creamed corn should work, too; the puree should have a consistency similar to applesauce. I'd recommend making the caramel sauce for the frosting in advance to give it plenty of time to cool before being added to the frosting. 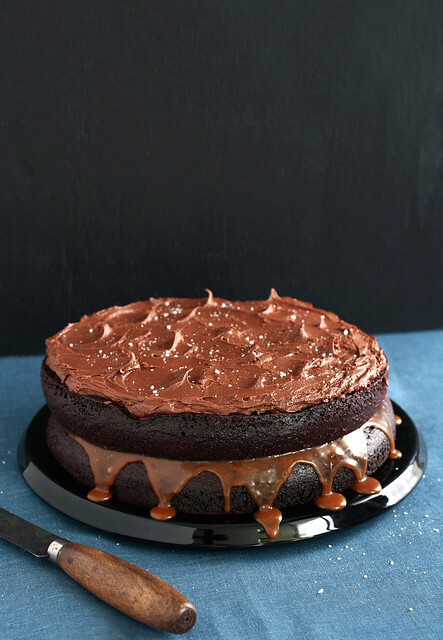 The recipe below makes a LOT of caramel sauce, much more than the 1/2 cup maximum you'll use for the frosting. I figure if you're gonna go through the trouble of making homemade caramel sauce, you might as well have extra to use on sundaes, bread pudding, whatever you fancy! But feel free to halve or even quarter this recipe if you'd prefer. Preheat oven to 350 degrees F. Line 2 muffin pans with paper liners (or use 1 pan and use 6 standalone baking cups). In a medium bowl, stir together flour, cornmeal, baking powder, and baking soda; set aside. With an electric mixer on medium high speed, cream butter and brown sugar until fluffy. Add vanilla then eggs, one at a time, beating between each addition and scraping down sides of bowl as needed. Reduce speed to low. Add 1/3 flour mixture, 1/2 creamed corn puree, another 1/3 flour mixture, the remaining creamed corn, and finally the remaining flour mixture -- beating until just combined after each addition. Divide batter evenly among lined cups, filling each 3/4 full. Bake until a toothpick inserted in centers comes out clean, 16 to 20 minutes. Let cool 1 minute in pan, then transfer cupcakes to wire rack to cool completely. 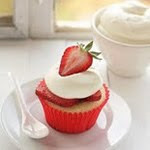 Unfrosted cupcakes can be stored overnight at room temperature, or frozen up to 2 months, in airtight containers. To serve, fill a piping bag fitted with a large round tip (like Ateco #808) and pipe caramel frosting swirls atop each cupcake. Right before serving, top with pieces of caramel popcorn. In a medium saucepan, combine milk, corn syrup, and 2 1/2 cups of the sugar. Cook over moderate heat, stirring until the sugar dissolves. Keep warm. Sprinkle the remaining 1/2 cup of sugar in a deep, heavy saucepan. Cook the sugar over moderate heat, swirling occasionally, until an amber caramel forms. Carefully pour the warm milk mixture over the caramel. It will bubble very strongly. Keep stirring -- this is normal. Cook over moderately high heat, stirring until the caramel dissolves. Stop stirring and cook until the caramel registers 235 degrees F on a candy thermometer -- this will take 5 to 8 minutes. Remove from the heat. Stir in the butter, vanilla, and 1/4 cup of heavy cream. Strain the caramel into the bowl of a stand mixer. Let cool 15 minutes, then freeze for 10 minute intervals, stirring between each, until sauce has thickened. Transfer caramel to an airtight storage container; set aside. Wash the stand mixer bowl. Combine the sugar and egg whites in the clean stand mixer bowl. Place the bowl over a pot of boiling water making sure the bottom does not actually touch the water. Whisk constantly until the mixture reaches 160 degrees on an instant-read thermometer (I just whisked by hand and cooked it until the sugar was completely dissolved and the top became foamy). Be careful not to curdle the egg whites, remove from heat if this starts happening. Remove the bowl to your stand mixer and beat on high speed with the whisk attachment for at least 3 minutes, until the mixture holds glossy, marshmallow-esque peaks and the bowl is completely cool (Very important - the frosting's consistency will be off otherwise). Reduce speed to low and slowly add 1/4 to 1/2 cup of the cooled caramel. Mix until fully incorporated. Store remaining caramel in the refrigerator. Posted by Xiaolu at 6:00 PM 71 comments so far. Add your own? Posted by Xiaolu at 3:00 AM 18 comments so far. Add your own? You know that feeling of relief and security returning home after a trip? Finally you can kick off your shoes, lie on your own couch, and sleep in your own bed. I experienced that familiar joy times 10 this week after visiting my dad and sisters. No no...not because it was a bad trip. Quite the contrary! Refreshingly unlike my usual exchanges with kids, my sisters SL and M took to me right away and would hardly let go, even at night! But experiencing firsthand the energy required to keep up with them did give me renewed respect for Dad, his wife, Michelle, and parents everywhere =). So what happened to make me so desperate for home? Just another round of travel delays - affecting me directly this time. My 6:30 pm flight out of Florida was delayed 4 times before Airtran finally canceled it at midnight. While a supposed lack of crew was the reason for our delays, we watched as the stewardesses clearly meant for our plane were moved to another flight. It was 2 am when we got to a hotel and our rescheduled flight was for 6:30, so we barely got a wink in before it was time to pack up again. With all the passengers ready to go at the gate, we were then told there might be another delay because the captain overslept! Finally, a man had heart failure as we were about to leave the gate and had to be carted off the plane. I really hope he's alright. Quite the trip, wouldn't you say? I don't mean to sound like a brat, especially since we did get free hotel rooms and even a ticket for our inconvenience. But these delays do have very real consequences. One passenger was quite distraught to learn that a loved one passed away while we were waiting. Sadly, she'd have made it to see him one more time had the flight arrived on time. I certainly don't expect airlines to control or predict bad weather, but they could certainly have better procedures in place to save everyone, including their own employees, some stress and frustration. Thanks for letting me get that off my chest. I'd like to end this post on the sweet note you all deserve. Here is another treat that I baked for my sisters. I find they have a sophisticated air about them from the lemon zest and neat slices. And the crunchy texture from the cornmeal is really a delight to the taste buds! They're not too fancy for the little ones, either, who munched away happily on these during our car rides. My littlest sister, M, was so impressed by them that she started calling me "cookie," and it took some effort to talk her out of it! XIAOLU'S NOTES: Please note that the dough needs to chill at least 2 hours before baking. 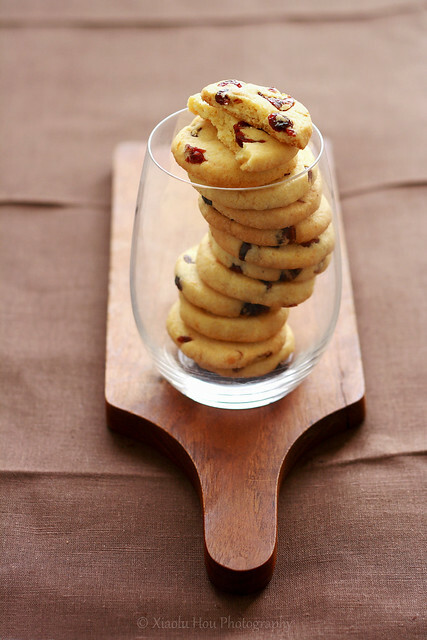 Any small dried fruit, such as golden raisins (which the original recipe called for) or dried cherries would also work well in place of dried cranberries. If your fruit is a bit too dry, soak it for a few hours in some warm water or appropriate juice. For that extra sumthin' sumthin', mix a lil' rum into the soaking liquid. Using an electric mixer, cream the butter and sugar in a large bowl until fluffy. Beat in lemon zest and salt, then egg yolks. Beat in cornmeal, then flour. Stir in cranberries. Knead dough just to combine; divide in half transfer each to a sheet of plastic wrap or parchment paper. Using plastic or parchment, form dough into two 1 1/2 x 6-inch logs. 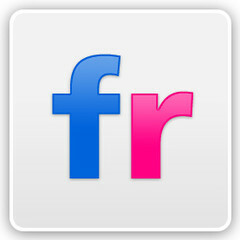 Refrigerate until firm, 2 hours or up to 1 day. Preheat oven to 325 degrees F. Line large baking sheet with parchment paper. Slice dough log into 1/4-inch-thick rounds. Arrange rounds on prepared baking sheet, spacing 1 inch apart and reshaping into rounds if uneven. Bake cookies until golden at edges, about 15 to 18 minutes. Transfer to rack. 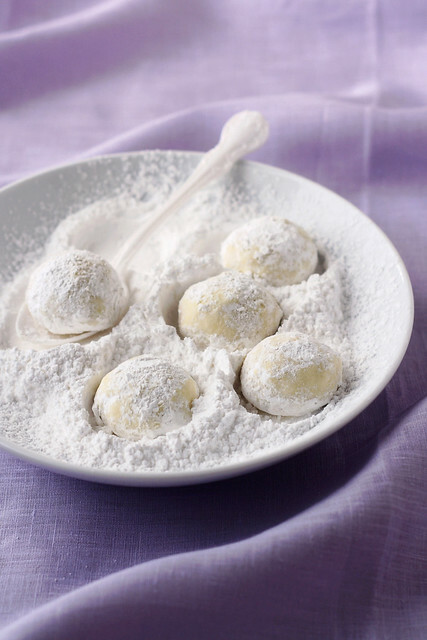 Cool completely, and dust with powdered sugar, if desired. Store airtight at room temperature for up to 4 days. Posted by Xiaolu at 8:00 PM 53 comments so far. Add your own? Would you like to try a cookie with a dozen names? What -- that doesn't get your salivary glands going? Well then, how about a light n' crunchy, buttery n' nutty ball of cookie goodness rolled in not one, but two coats of pretty powdery sugar? Oh yes, I've got your attention now 8). 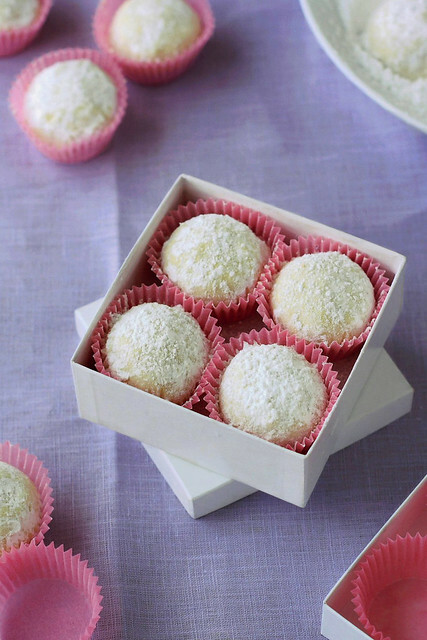 Whether you know these treats as Mexican wedding cakes, Danish wedding cakes, Russian tea cakes, snowballs, butterballs, or some other moniker, there's no denying their widespread appeal. I loved 'em so much as a kid that I'd inhale dozens as a time. I outgrew that habit long ago (good thing since I plan to become a dietitian), but I still adore these treats for the great taste and memories that come with them. They were first on my list of homemade treats to bring when visiting my dad and baby sisters (2 and 4 years old) in Florida. I was an only child until 22 and no longer expecting siblings by then, so I have a LOT to learn about being a big sis. 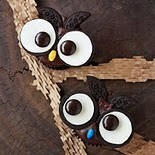 But considering what cookie monsters these girls have already proven to be, I think we'll have a lot in common ^_^. Do you guys have a regional/family version of these cookies? Tell me about them please! XIAOLU'S NOTES: Please note that the dough needs to be prepared ahead of time and chilled at least 6 hours before baking. Don't try to bake more than one tray at a time, since baking each tray in the middle of the oven is crucial to getting evenly cooked and browned cookies. Feel free to substitute walnuts, almonds, pistachios, or almost any other nuts you like for the pecans. Have fun with it! Sift flour, salt, spices, cocoa powder, and salt together into a medium bowl; set aside. Cream together butter and 1/2 cup powdered sugar in a large bowl with an electric mixer at moderately high speed until pale and fluffy, about 4 minutes. Beat in vanilla; then add flour, pecans, chocolate chips, and coconut (if using) and mix at low speed until just combined. Chill, covered, for at least 6 hours. Preheat oven to 375 degrees F. Let dough stand at room temperature until just pliable, 15 to 25 minutes. Meanwhile, sift remaining 2 1/2 cups powdered sugar into a large shallow bowl. Roll cookies in powdered sugar again when cooled. Happy New Year, my dears! Eep...can somebody tell me how it got to be 2011 already? Equally important (or perhaps more?) I'm wondering how long it'll be before I remember to write the correct year on things. Like I was lining up a few drafts for upcoming posts yesterday, but damn it they kept disappearing! Ditz that I can be, it was 10 minutes before I realized they'd been shoved back in 2010. I guess I'm in for some "fun" times until I adjust... =). That issue aside, it's funny how time moves by so fast these days as opposed to when I was younger. Now there's too often little chance to savor the sweet moments. Which is yet another reason I'm thankful to have this site and all of you. Not only can I share my passions and personal adventures here, but your responses and our interactions become wonderful new experiences in and of themselves that are all saved. I just spent an afternoon flipping through the posts of last year. My favorite 6 are listed below -- I hope you remember (or discover) them as happily as I did! Buuuut you didn't think I'd start off the New Year without a new dish now, did ya? One of my resolutions is to tackle my to-try recipes list, which has become quite a beast! It includes fancy treats like the infamous macaron, but I decided to start slow with these easy, versatile popovers. 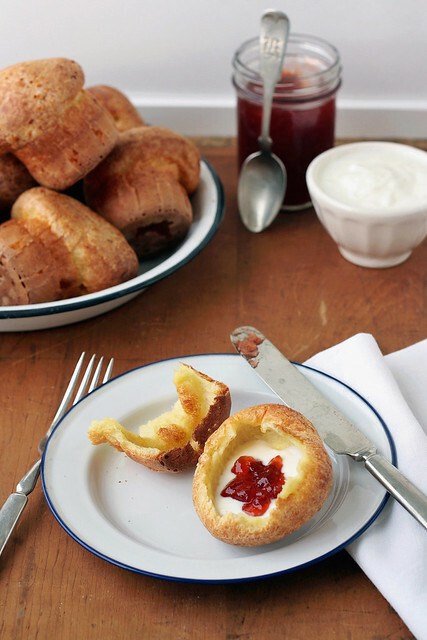 If you've never had one, popovers are light, hollow rolls with golden crusts and soft insides. Their buttery, eggy (in a good way) flavor pairs wonderfully with jam and cream, honey, or simply a smear of butter. They're also a versatile canvas for playing with other flavors; for example, I plan to try a savory herb and cheese variation mmm. The recipe is at the end of this post if you'd like to give it a go yourself :). Finally, it's on to the list! 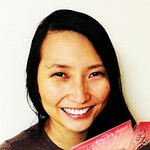 Thank you all for making 2010 a year to remember here at 6 Bittersweets! I'd love to hear what you'd like to see more of in 2011, and I'm so excited to share even more yummy goodness with you through the New Year! 6. 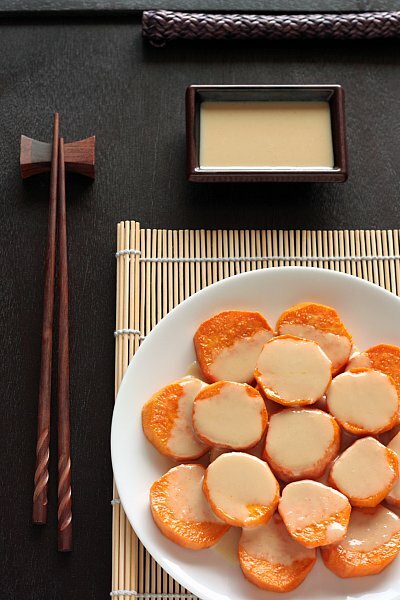 Roasted Sweet Potatoes with Miso-Tahini Glaze - Excited is an understatement of how I felt when I found the recipe for this favorite from the Teaism restaurant. The sauce is simply addictive! 5. 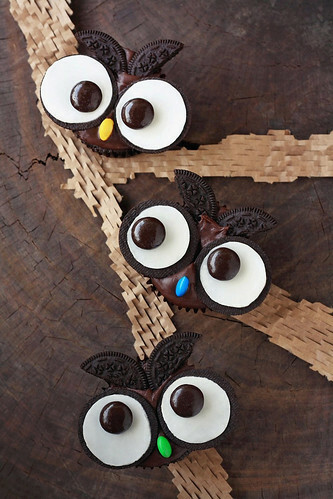 Cookies N' Cream Owl Cupcakes - Super delicious, cute, and uses easy-to-find ingredients...these cupcakes were a resounding success. The post remains one of my most popular. 4. 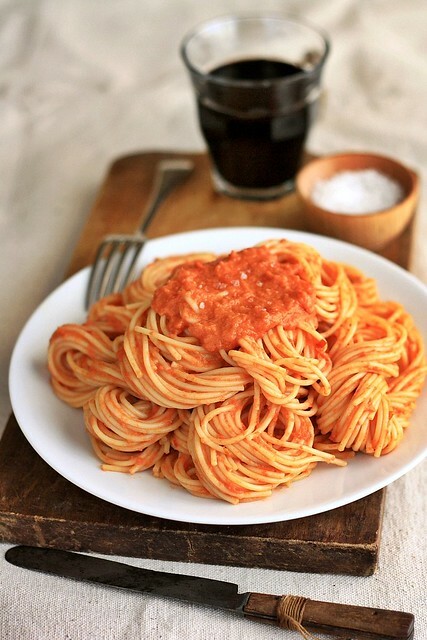 Spiked Spaghetti with Tomato Vodka Cream Sauce - My boyfriend's been scarfing this down and asking for more for so long that I can't believe I only just thought to share this. It doesn't taste like alcohol, but the vodka really adds something special to the sauce. 3. Browned Butter Pizzookies with Pecans - It wasn't until I published this post that I realized so many of you had never heard of pizzookies. 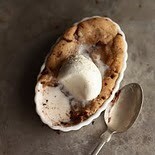 These babies are quick to whip up and are just full on nutty buttery gooey chocolate-y goodness. I dare you to go back to regular cookies after ;p.
2. 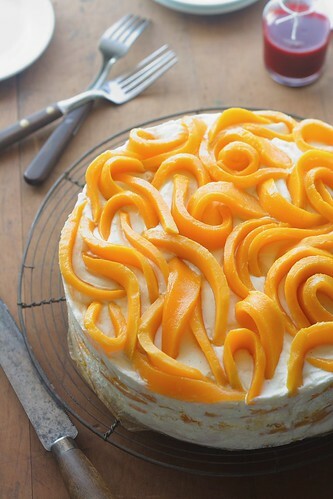 Mangomisu Trifle Cake - Although this was a gorgeous Delicious magazine cover recipe, I didn't expect mine to turn out nearly as pretty or tasty as it did. With all that fruit and creamy mascarpone, this cake wasn't cheap but was worth.every.penny. 1. 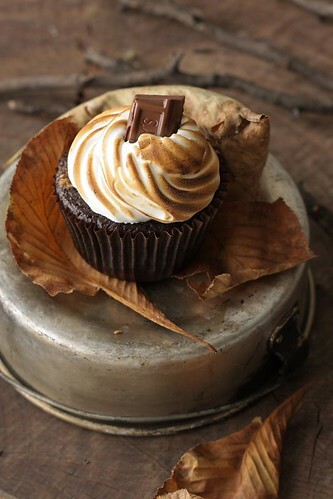 S'mores Cupcakes - I almost didn't make these cuppin' cakes due to illness, but thank goodness I decided to soldier on because these are the best cupcakes I've made or eaten to date. And I welcome any excuse to wield my torch and unleash the inner pyro (mwahaha) 8D. Preheat your oven to 425 degrees F. Grease your popover or muffin pan or standalone paper souffle cups. In a large bowl, mix flour and salt together. In a small bowl, beat eggs and milk together. Add egg mixture and melted butter into flour mixture. Mix everything together well by hand or using a blender, food processor, or stand mixer. If your batter is lumpy, pour it through a strainer to remove the lumps. The batter will be quite thin, similar to the consistency of crepe batter. Pour batter into greased popover or muffin pan or standalone baking cups so that each cup is half filled. 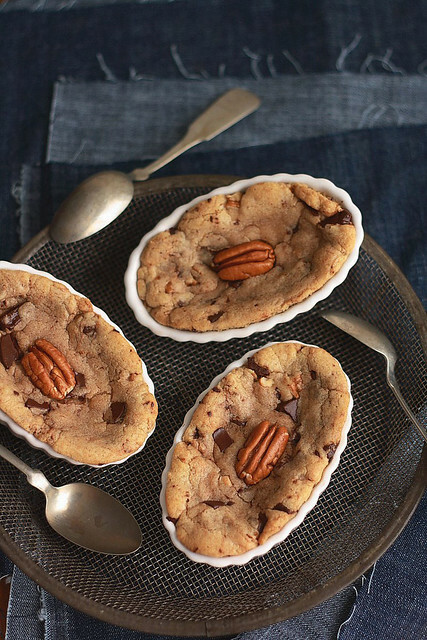 If using standalone cups, set them on a cookie sheet for baking. Bake for 25 minutes, without opening the oven door. By that time, the popovers should have popped and should be nicely browned. At this point, lower the temperature to 350 degrees F and bake for another 15 to 20 minutes to dry out the insides. Remove from oven, let cool slightly, and enjoy with your meal! Posted by Xiaolu at 9:00 PM 45 comments so far. 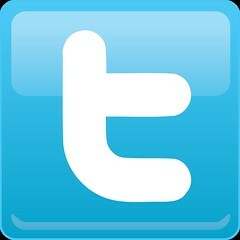 Add your own?